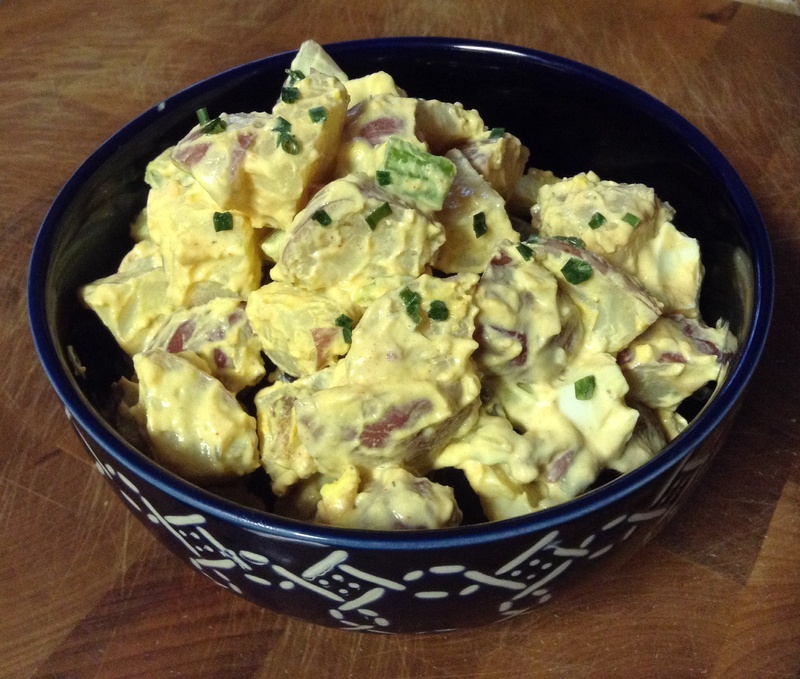 There is nothing like a creamy and refreshing potato salad, especially on a warm day…or as leftovers late at night…hmm, maybe that’s just me 😉 . This is a slimmed down version, so throw that guilt right out that window. But if you want to splurge, try adding a sprinkle of bacon…hey I won’t judge! First cut the potatoes into bite sized pieces and place in a medium pot. Cover with water until it covers the potatoes. Boil for 10 minutes on high heat until slightly softened. Insert a fork and if it inserts with a little give, they are perfect. Drain and place in a bowl in the fridge for 20 minutes. Meanwhile boil your eggs in a small pot filled with water on medium high heat for 5 minutes. Turn the heat off and cover with a lid for another 5 minutes. Drain and peel the eggs and place them in the fridge for about 10 minutes. Once everything is chilled, we can start to assemble the salad. Is it really a salad if there is no lettuce in it?? Anyway, in a large bowl start to mix all of the wet ingredients, and seasoning (aka FLAVOR). Dice the celery, pickles, and eggs to add to the mixture. Now add the potatoes and stir everything together gently. Add in some chopped bacon pieces if desired. Chill until ready to serve. This is definitely one of my favorite summer recipes. It is perfect to serve at you next barbecue. Who doesn’t like french fries, right?! But they are full of fat and sodium when they’re fried in all that oil. That’s why I came up with this healthy version, I think they taste even better. (Sorry Olivia Newton-John & John Travolta, no Grease here). Are they still called fries if they are not fried…hmmm. Anyway, I know you will enjoy these French fries (or baked potato strips, or whatever you want to call them 😉 ). Preheat the oven to 425°. First cut the potatoes lengthwise into strips. In the meantime bring a big pot of water to a boil. Once the water is boiling, carefully place in the potato strips. Boil for 5 minutes, then stain them. In a large bowl, combine the canola oil along with salt and pepper. This is the best part, you can add in whatever seasoning you like. Maybe some garlic powder, or chipotle pepper, or even red pepper flakes or fresh herbs. Whatever you want, you are the master of your kitchen (that’s right…makes you feel empowered doesn’t it…oh yeah!) Toss the potatoes in the mixture and place on a foil lined baking sheet in one even layer. Cook for 30 minutes, flip halfway through. Let cool for 5 minutes, and there you go, delicious and crispy fries. Much healthier than fast food, and definitely one of my favs! Enjoy! Whether you call it stuffing or dressing, you’ll definitely call it delicious! This recipe is fool proof and goes perfectly with Thanksgiving turkey. Maybe it will even upstage that turkey, it is definitely my favorite part of Thanksgiving (I’d much rather stuff my belly with it instead of the bird 😉 ). Preheat the oven to 375°. In a large bowl, crumble the cornbread into pieces. 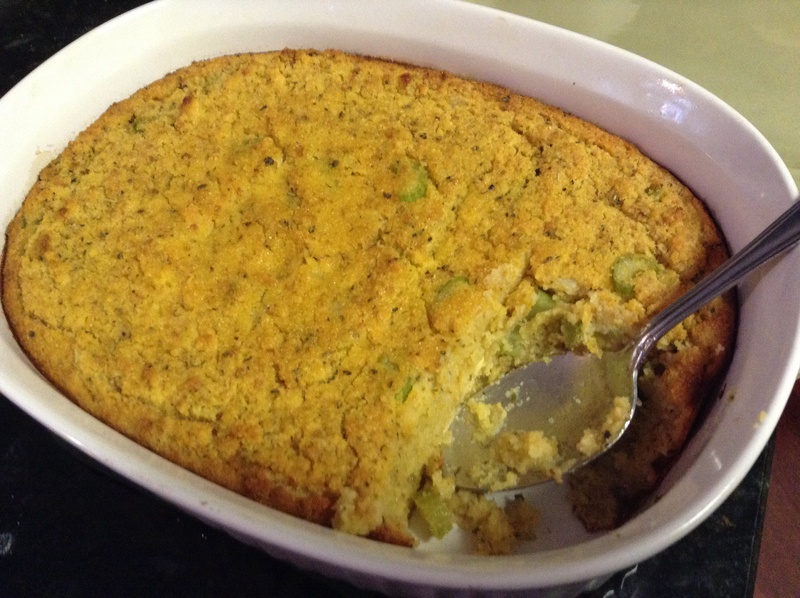 I love cornbread and it’s the perfect texture for stuffing. I like to cook the cornbread the day before to let them dry out a little. Pour in the chicken stock and let the cornbread soak (how easy, it’s instant FLAVOR). In the meantime, chop the onion and celery and cook with the oil over medium heat with 1 tbs of the Italian seasoning until softened (about 4-5 minutes). (Oh that smell gets me every time, now it smells like Thanksgiving…let the parade begin…yay I think I just saw Snoopy). Add the onions and celery to the cornbread mixture. Fold in the eggs and add the rest of the seasoning. Bake for 50 to 60 minutes until the top is golden brown.